The government may relax rules on inward foreign direct investment (FDI) to prevent it from sliding further, sources from the Ministry of Commerce said yesterday. "We have drawn up a plan to relax some restrictions on foreign investment, particularly in the real-estate sector," an official from the Ministry of Commerce, who did not want to be named, confirmed to China Daily. "This is a coordinated job, involving a number of other ministries." The proposal - submitted to the State Council, or the Cabinet - lists 42 rules covering taxation, foreign exchange and regulatory supervision, and calls for an easier approval process for foreign investment, China Times reported on the weekend. One of the biggest changes is loosening regulation on foreign investment in the property sector. Other suggestions include giving foreign investors access to the high-tech industry and relaxing checks on individual foreign investment. FDI dropped 17.8 percent last month from a year earlier to $6.38 billion, the eighth straight monthly decline amid the global economic downturn. But the drop was less steep than in April, when inflows fell 22.5 percent on a yearly basis. 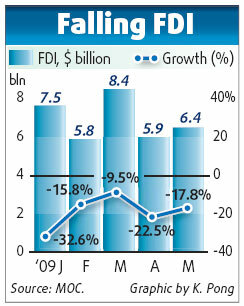 In the first five months, FDI fell 20.4 percent to $34.05 billion. "The ministry's proposal is important to maintain growth in investment, one of the three drivers of economic growth, in the second half of the year," said Li Jianfeng, macro-economic and trade analyst with Shanghai Securities. As government-led investment cannot maintain momentum in the next six months, stimulating investment from the private sector, including FDI, is critical to ensure GDP growth, Li added. According to statistics from Shanghai Securities, real estate-related investment accounted for 10-15 percent of FDI in the past three years. "The loosening of foreign investment rules in the real-estate sector would help to boost FDI quickly," said Grant Ji, director of Savills (Beijing), a UK-based real estate service provider. "And the change will be particularly attractive to international property developers who do not have a presence in China." Ji told China Daily that a number of US property developers dropped investment plans at the end of last year because of too many restrictions and the slow approval process. The government introduced a slew of policies to prevent the influx of foreign capital into the sizzling real-estate market in 2006 and 2007. These included raising the ratio of registered capital in developers' overall investment and restrictions on residential purchases by foreign institutions and individuals, as well as tightening the approval and supervision of foreign investment in the sector. But the decline in property prices and transactions amid the economic slowdown last year has prompted policymakers to consider relaxing controls to bolster economic growth.